A World to Win | Review | Books | Can we have our Old Labour back, please! Can we have our Old Labour back, please! The Blair government is more than a right-wing version of the Labour Party under previous leaders, or simply a product of spin, says Phil Sharpe. He takes issue with the suggestion that Blairism is a temporary phenomenon and that Labour can return to its Old Labour and reformist roots. Despite its impressive empirical detail this book* does not provide a satisfactory theoretical basis for understanding the character of New Labour. Instead, David Osler provides us with descriptive impressions about Labour’s links with business, outlined in the most sensationalist terms. In his introductory remarks, Osler contends: “But from the point of view of business, Labour and the Conservatives are now essentially interchangeable. In some respects, Labour is even preferable.” This would seem to suggest that the Labour Party has evolved into a party for business. But Osler ultimately rejects this characterisation in the face of his own empirical evidence. Osler maintains that the Labour Party was evolving into a more pro-business and right-wing entity before Blair: “Long before Blair’s leadership, Labour was doing its best to appear business friendly.” But Labour under Kinnock’s leadership, and even with John Smith at the helm, was having difficulties convincing business that the Labour Party could be a credible alternative government. Relations with business remained at a low ebb throughout the 1980s despite strenuous efforts to mend fences, Osler notes. It took the debacle and incompetence of the Tory government at the time of the 1992 currency crisis to make business more interested in Labour, as the book notes: “The party no longer had to go in search of business. Business would now come in search of Labour.” Nevertheless Osler does not rule out the possibility that Smith would still have formed an old style reformist Labour government. In other words, Osler is reluctant to associate Smith with Blair, because he wants to conceive of New Labour as simply a Blairite project, essentially a product of a coup by the controllers of spin rather than a response to new material conditions. The fact that Osler avoids is that New Labour is not an aberration from the “natural” Old Labour but rather the transformation of the party in conditions where “old style” reformism is no longer tenable in the conditions of the growing crisis of globalised capitalism. Osler is not sure how right wing Labour would have become if Smith had remained as leader, but he is confident about the difference Blair has made. 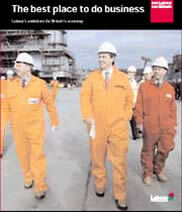 The dropping of the Clause 4 commitment to nationalisation showed Blair’s symbolic commitment to pro-market policies, the book acknowledges. Yet the demarcation made between Old Labour and New Labour is arbitrary and impressionistic. It does not begin to explain how material and social conditions have meant that the Labour Party could only survive as a potential governmental alternative to the Tories by adopting the pro- market and neo-liberal agenda of capitalism. This is why there is no qualitative difference between Kinnock and Smith with Blair, only a difference of individual style and emphasis. Osler points to increased business influence within the Labour Party. For example, Lord Sainsbury alone has provided £9 million. Furthermore, the party conference is increas-ingly supported by commercial sponsor-ship, which is also a means to increase funds. On the other hand, trade union influence is decreasing, and soon after Blair became leader, trade union contributions for the first time fell below 50%. The unions have become increasingly marginalised in the policy making process. Record numbers of party members left the Labour Party within a year of the formation of Blair’s government in 1997 because of disillusion with its right-wing policies. Indeed, the book produces evidence to show a long-term decline in party membership. Osler does not endorse Blair’s own definition of New Labour. This shows the eclecticism of his analysis. On the one hand he has carried out a convincing description of the evolution of the Labour Party into a direct representative of the capitalist class. Yet his analysis is undermined by impressionism and inconsistency. Osler cannot connect it to the development and change of the Labour Party from a reformist mediator into the expression of globalised capitalism in the 21st century. Instead, Osler wants to perpetuate a static image and mythical view of Old Labour, so that it can “recapture” New Labour from interlopers and spin merchants. This eclectic view of the world where nothing really ever changes in a fundamental way is, in political terms, disarming. Strategic political objectives are then reduced to patching things up rather than facing reality and coming up with new solutions. Osler does not want to face the fact that the so-called Old Labourites from its Bennite left to Prescott and Cook are also engaged in the process of the transformation and reformation of the Labour Party as a party of the capitalists. This is not to say that the Labour left cannot continue to resurface to articulate discontent, but it has no strategic alternative to New Labour in the context of the global capitalist undermining of the nation state and welfare state. Instead so-called Old Labour can only provide a gloss and alternative public relations spin on the reactionary politics of New Labour. This is shown by Claire Short’s call for UN support for action over Iraq, which means that the question of principled opposition to war is undermined and diluted. Yet it serves to provide ideological consolation that the ‘left’ can still provide a credible alternative to Blair. The actual character of Short’s politics, and those of other so-called leftist “Old” Labourites, is outlined by their vociferous opposition to the anti-capitalist movement and uncritical support for a “benevolent” form of capitalist globalisation. Rather than tackle these important strategic questions about the political evolution of the Labour Party, Osler is content to provide a pseudo-radical theoretical substitute which is based upon moral outrage about the level of corruption in New Labour. He shows that New Labour’s close relations with business are often based upon patronage, as in the awards and honours system. He outlines in detail how New Labour is supported by a collection of opportunist and corrupt entrepreneurs, which lays them open to accusations of sleaze. However, this emphasis on the corrupt aspects of the relations between New Labour and business is used to try and show that the links are possibly still shallow and transitory. Hence he indicates that there is still substantial support for the Tories within the business community. Thus the links between New Labour and business are not portrayed as an organic expression of developments within the capitalist mode of production, but rather as an indication of narrow, unprincipled and crude self-interest on both sides. Of course, this suits Osler’s view that New Labour has still not definitively become a party of business and the bosses. However, this understanding of privatisation as dogma running amok is inadequate. It does not explain why a seemingly irrational policy is nevertheless implemented. Instead, the suggestion is that New Labour was brainwashed into carrying out these self-destructive and unnecessary projects. What needs explaining, however, is that it is no longer economically possible to fund expensive capital projects unless it means the most lucrative returns for private capital. It may not fit Osler’s rationality test but it sure is profitable. Osler’s critique of the privatisation polices of New Labour is an expression of a desperate and nostalgic call for “New Labour to become sensible” and to therefore return to the “expansionist” policies of “Old” Labour. He is unable to explain why the return to the welfare state under capitalism is an increasingly unlikely project, and why this is reflected in the reactionary pro-privatisation politics of New Labour. “There has been much debate in the left press over whether or not Labour can now be described as in any sense a workers’ party. The answer is probably still ‘yes’.. but only just. Political and financial links with the trade unions, while much attenuated, remain in place. “Moreover, despite its best efforts, Labour is not the party of business. Neither are the Conservatives any more. But both can fairly claim to be parties of business. Britain now has a system not dissimilar from the US, where government alternates between two safe pairs of hands, one of them marginally more union friendly. So despite the reactionary extent of the policies of New Labour, Osler can still use a crude empirical and sociological method that defines Labour as a supposed workers’ party because the majority of the FTSE 100 are still too shy to become open supporters of New Labour! But New Labour is not a unique and specific phenomenon of the sleazy nature of British politics. Rather these traits are a specific expression of a general trend within reformist politics in the era of globalised capitalism. From Australia, to France, Sweden, and elsewhere, a variety of Social Democratic governments have carried out policies that uphold privatisation and attacks upon the welfare state. Blair’s New Labour is only the most grotesque and degenerate expression of this universal transformation of Social Democracy into the open upholders of the structural requirements of capital accumulation in this uncertain period for globalised capitalism. In other words, we need to give up the illusion that we can somehow carry out a miracle and transform Social Democracy into a more benevolent political entity - as if we can turn back and change the events of history through prayer! Instead we have to understand what are the objective conditions for its actions, and why we have to intransigently oppose forces such as New Labour rather than wish for conciliation through the reversal of history. Osler’s approach seeks to uphold this type of idealist reconciliation despite the vehemence of his criticism of the actions of New Labour, because to him it is not too late to go back to Old Labour. That is the real theoretical and political reason why he refuses to call New Labour a party of business, and instead pedantically and semantically calls it a party for business. The main historical and ideological basis for reformism was to perpetuate the illusion that the interests of the workers were served by parliamentary representation and reform rather than revolution. Thus for Osler to call the Labour Party a workers’ party because of continued trade union support is a crude sociological generalisation. The most active form of union support was and is from the trade union bureaucracy because it too is opposed to revolution. In contrast, workers and rank and file trade unionists have had an essentially passive relation to the Labour Party, except in periods of mass unrest. 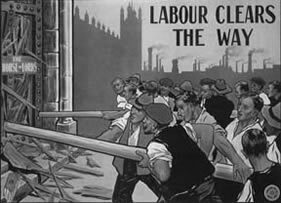 Today union bureaucrats are essentially trying to uphold their sectional interests, and so prefer to retain the link with Labour rather than oppose its reactionary transformation into New Labour. New Labour is becoming the most practical and persuasive party of the capitalists because it is seen to carry out the neo-liberal agenda of capital in the most effective and ruthless manner. So even if New Labour is not yet socially acceptable to some of the most important capitalists, the capitalist class in its totality knows in general that Labour has become a party of business. The Tories have become so ineffective because New Labour has replaced them as the most cogent and coherent party of the bourgeoisie. Why has Osler come to the inconsistent and eclectic conclusion that New Labour is some type of workers’ party? Osler is a supporter of the Socialist Alliance, and his book was generously praised in a preface by Paul Foot of the Socialist Workers Party, the most prominent section of the Alliance. In general, the Socialist Alliance does not believe that New Labour is an expression of corporate-led globalisation. On this basis they conceive that the role of the Socialist Alliance is to put pressure on New Labour to somehow return to its Old Labour and reformist roots. Hence the Socialist Alliance is incapable of developing a principled opposition to New Labour because of this idealist and nostalgic wishful thinking. This book, despite its impressive detail about New Labour, is therefore the theoretical expression of the opportunist politics of the Socialist Alliance towards the Labour Party.